How do I Enjoy My Holidays without gaining weight when there are so many temptations? To avoid gaining weight at the holidays, we need to craft a holiday weight strategy. This personalized holiday strategy needs to take into account your life, your traditions, your preferences, and your body. No matter what country you live in or what holidays you celebrate, these tips can help you be strategic about your holiday indulgences. There are three strategies that make up the RHH Holiday Weight Strategy: Minimizing Temptations, Dealing with Free Food, and Splurging on Purpose. Minimize Temptations--The sub-conscious Assistant part of the brain is very sensitive to environmental cues, so wait to buy or make treats until the last minute, store them in out-of-the-way, hard to get to places, and then aim for no leftovers. Deal with Free Food--Free Food is a special temptation to your brain because it's a good value. The problem is that free food is everywhere during the holidays. Watch the video to find out how to deal with the almost irresistible nature of free food. Splurge on Purpose--Prioritize which items of the holiday feast are important to you and which aren’t. Enjoy the splurge, and then aim not to have leftovers. Most weight gain comes from the leftovers, temptations, and free food on the days and weeks leading up to and after the holidays, so remember that the mantra "The Holiday is just a Day--not a season." Download The Holiday Splurge Sheet and enjoy your holiday without any weight gain. "How do I Keep from gaining weight during the holidays when there are so many temptations?" It had taken her the whole previous month to take off that weight. Those extra pieces of pie weren't really ones she wanted. She ate them just because they were there. They weren't worth one month of habit-making effort she later lamented. Ready or not, the holidays are coming. According to Brian Wansink of the Cornell Food and Brand Lab, if you're like most Americans, this week you'll weigh the lowest you'll weigh all year. It’s all up from here. He warns that many people lose 1/2 the extra holiday weight quickly, but then take 5 months of the new year to take off the other half. Some of us never quite get those last few pounds off. And those holiday pounds may account for our slow and steady weight gain each year. I’m all for splurging on the holidays. But with my 40 something, insulin-resistant, hypothyroid metabolism, I want to make each one of those splurges count. I want to be strategic about my holiday indulgences. I bet you feel the same way. Real Healthy Habits' (RHH) main emphasis is working with the powerful, sub-conscious, habit part of the brain (I call it the Assistant) instead of against it for our health and weight goals. The Assistant is key to losing weight without dieting and keeping it off. 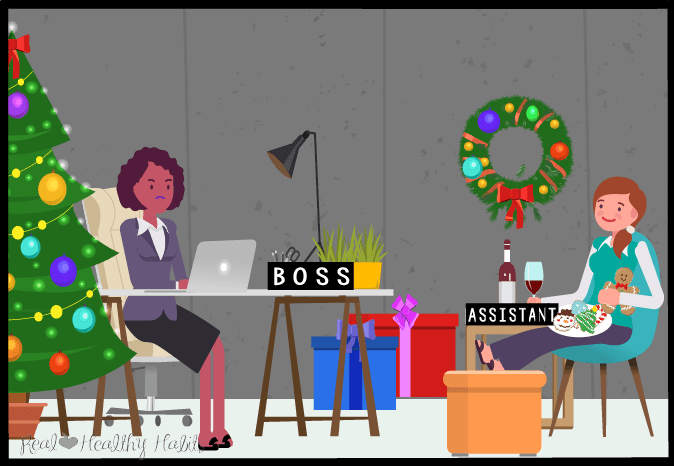 The thing to remember about the holidays is that the Assistant brain takes over the eating responsibilities when the Boss brain (responsible for goals, motivation, and willpower) is busy. And what part of the year is busier than the holidays? We all know the answer to that! Also, the sub-conscious Assistant part of the brain is very sensitive to environmental cues and temptations. And everywhere you look, there's a treat or indulgence calling your name. The Assistant brain is powerful, but she is motivated by pleasure, avoiding pain, and conserving energy (being lazy). So if the Boss brain is busy, the Assistant will take advantage of the countless opportunities to indulge during the holidays—like my client discovered with those pies. The solution to prevent holiday weight gain is to craft ourselves a holiday weight strategy. This Real Healthy Habit (RHH) Holiday Weight Strategy will keep the Assistant in line before she goes all Holiday rogue on us. What you need is a personalized holiday strategy that takes into account your life, your traditions, your preferences, and your body. No matter what country you live in or what holidays you celebrate, these tips can help you be strategic about your holiday indulgences. 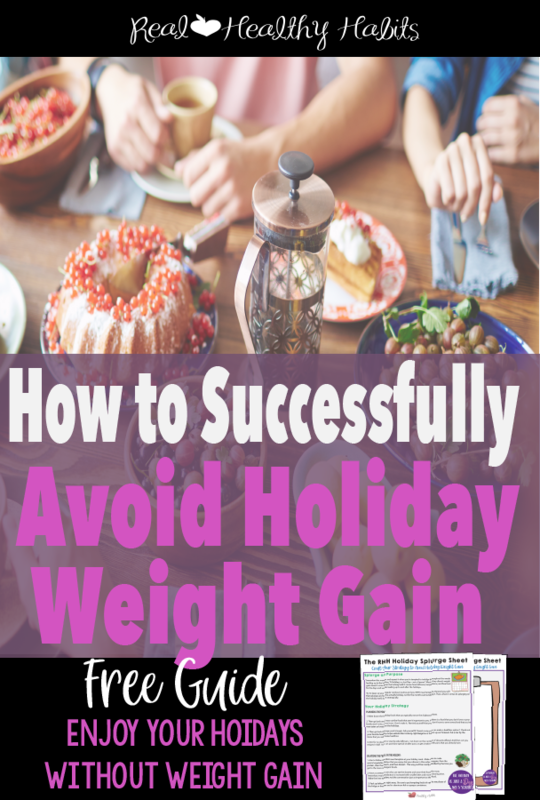 Crafting your RHH Holiday Strategy can help you keep holiday weight gain at bay and even achieve your Mission Impossible—Holiday Weight Loss. There are three strategies that make up the RHH Holiday Weight Strategy: Minimizing Temptations, Dealing with Free Food, and Splurging on Purpose. The sub-conscious Assistant part of the brain is very sensitive to environmental cues, so wait to buy or make treats until the last minute, store them in out-of-the-way, hard to get to places, and then aim for no leftovers. Wait until the last minute--I buy my Trick-or-treat candy the day before Halloween and make sure that it's candy that I don’t find tempting. Aim for no leftovers--I buy 1-2 bags less candy than I actually need. When my kids come home from trick-or-treating, we have them pick out their 20 favorite pieces. Then we recycle all the rest back into the bowl for trick-or-treaters. My aim is no leftovers. If we do have leftovers, it’s stuff I have no problem throwing away. Free Food is especially tempting to our brains. This is due to the Assistant part of our brain being an Economist. The Assistant knows that Free Food is a special deal and wants to take advantage of it. The problem is that free food is everywhere during the holidays. Check out this video to find out how to deal with the almost irresistible nature of free food. Why are donuts (and other treats) so tough to resist when a co-worker brings a box into the break room? Hint: It has something to do with the way we're wired to maximize calorie intake with the least amount of work expended. Remember this mantra and repeat it whenever you're tempted. "A Holiday is a Day—not a (three month) season." Most of my clients' weight gain doesn’t come from the holiday itself. It comes from leftovers, temptations, and free food for the days and weeks leading up to and after the holidays. Try to keep up your regular workout routine and your RHH meal template around the holidays. 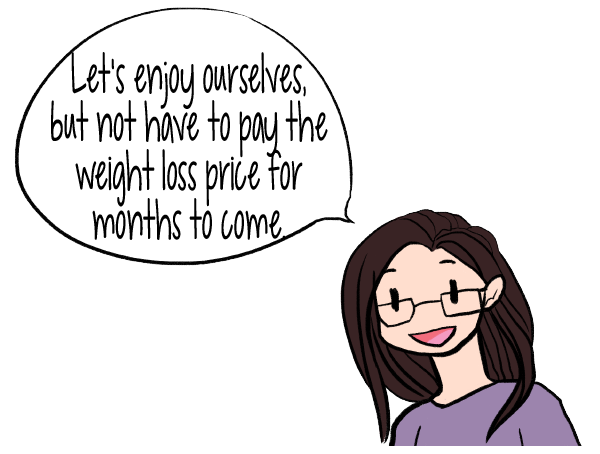 Remind yourself that splurges are for the actually holiday, not for the months surrounding it. Then when it comes to splurging on the day itself, do it strategically. Prioritize which items of the holiday feast are important to you and which aren’t. Remind yourself that you don't have to serve every food that you've ever eaten or loved on the holidays. If there is a food that you don't love or your family won't miss, don't make it. I find that my kids don't eat much of the sweet potato casserole, so I’ve switched to roasted root vegetables instead. Aim to follow the RHH meal template at your holiday meal. Eat your dinner in this order--veggies, then the protein, and then the starch. Have a contest to see who can eat the slowest and savor their food the most. Remember meal satisfaction is increased with smaller bites and more chewing time. Cut down on the number of desserts offered. I've gone from making pumpkin cheesecake and several pies down to just cheesecake. If you want to avoid holiday weight gain (or even lose weight), be sure to Craft your RHH Holiday Strategy. Don’t just have good intentions. Make a holiday plan and then work it. A good plan will always win over great intentions. 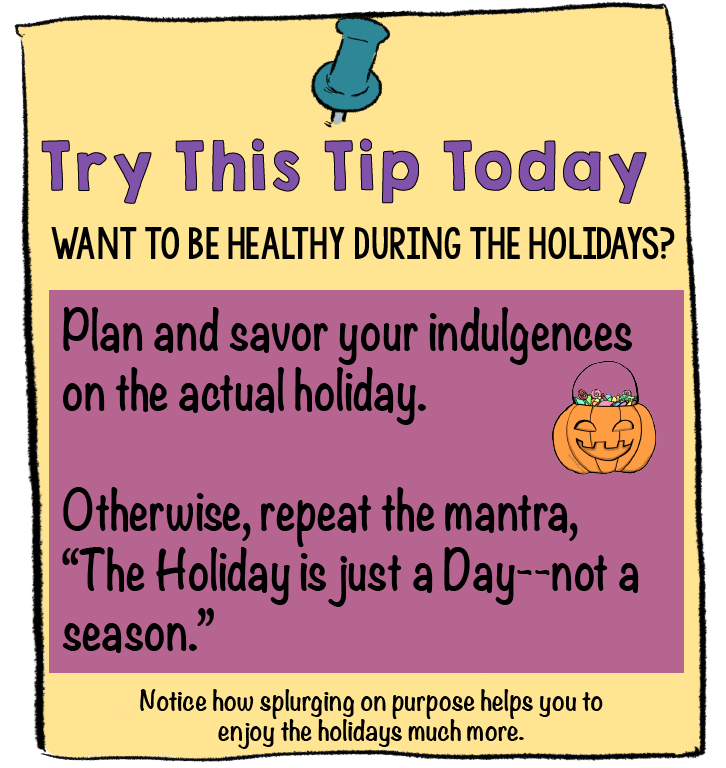 To Craft a Strategy to Enjoy the Holiday and Avoid the Weight Garin Regret, download The RHH Holiday Splurge Sheet. Fill it out to make sure that you prioritize all your special treats, enjoy and savor them, and prevent holiday weight gain. 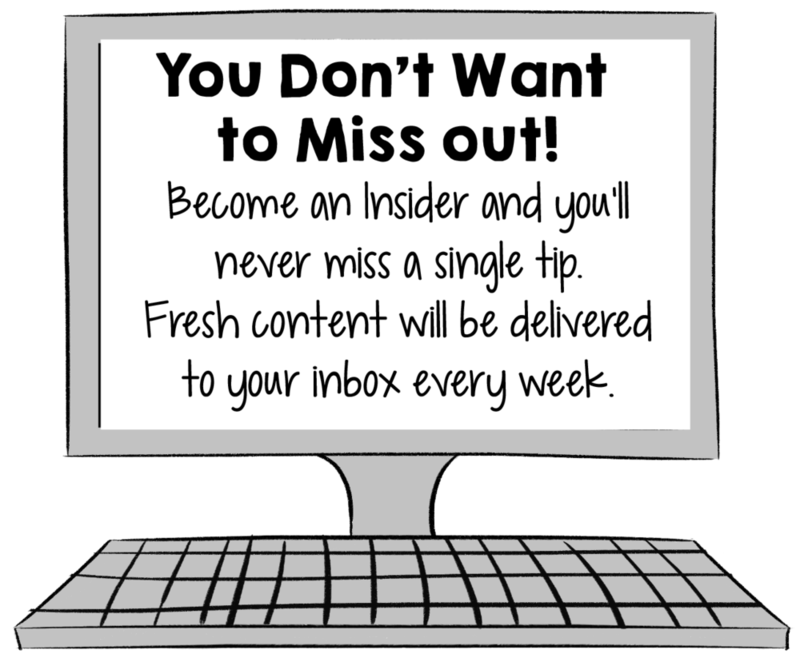 Want More Real Healthy Habits? Head on over to the Real Healthy Habits Facebook page to share your comments, to ask questions, or get support.